FutureEverything Conference: May 12-13, 2011: Top-level debate and keynotes on the possibilities of the near-future, the power of globally-connected communities, and the impact of Open Data upon society, digital culture and art. Award Jury Now Shortlisting: Submitted entries have been passed to the International Jury who will select the three outstanding projects that will fight it out for the 2011 prize. 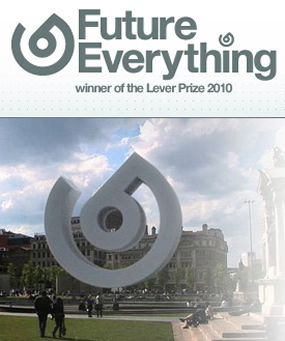 The Winner will be decided by an open vote by the FutureEverything Community in 2011. The Jury in 2011 is Bruce Sterling (US), Yukiko Shikata (JP) and Jeremy Myerson (UK).